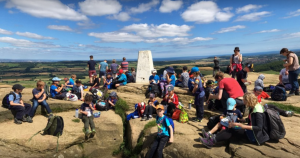 Our Beavers today showed that they are at their “Peak” fitness as they undertook the challenge of Roseberry Topping. The sun shone as they worked their way up the torturous climb. Their efforts weren’t in vain because as they reached the summit they were able to look down on the whole of North Yorkshire. These Beavers are clearly a cut above the rest! Could somebody please ensure that you don’t leave Eeyore behind?